From award-winning Norwegian author Arne Svingen comes “an unusually exciting and funny story” (Dagbladet) about a relentlessly positive teenager who uses his love of opera to cope with his less-than-perfect home life. Bart is an eternal optimist. At thirteen years old, he’s had a hard life. But Bart knows that things won’t get any better if you have a negative attitude. His mother has pushed him into boxing lessons so that Bart can protect himself, but Bart already has defense mechanisms: he is relentlessly positive…and he loves opera. Listening to—and singing—opera is Bart’s greatest escape, but he’s too shy to share this with anyone. Then popular Ada befriends him and encourages him to perform at the school talent show. Ada can’t keep a secret to save her life, but Bart bonds with her anyway, and her openness helps him realize that his troubles are not burdens that he must bear alone. The Ballad of a Broken Nose is a sweet story about bravery, fear, bullying, sports, and music. But most of all it is about the important days of your life, days when everything seems to happen at once and nothing ever will be the same again. It doesn’t matter. These things happen. I’m lying on the floor. A few seconds ago, I was standing on my feet. The world was on an even keel and I actually felt things were going better than they had been in a long time. Some punches always come as a shock. The room is sloping around the edges and I feel slightly seasick. When I nod, it feels like I’m sitting in a washing machine. Of course I can get up. Just not right now. All I want to do is lie here. A little bit longer. Of course he didn’t mean to hit so hard. Christian flickers in front of my eyes. As if he was on a badly tuned TV. I like Christian. I like everyone at the gym. Wouldn’t surprise me if they liked me too. It’s the coach talking. The one who says it’s all about believing you can move mountains. That I can be as good as I want to be. And I believe him when he says it. Even though I don’t necessarily believe it as much in the evening. Or the next morning. Or at school. And perhaps especially not when I’m lying here and feeling sick. The coach and Christian help me up. I’m standing on my own two feet again. “Take a break, why don’t you,” the coach says. I don’t dare to nod. Just head off toward a bench and sit there until the world has stopped tumbling and spinning and shaking. “Boxing’s not about how many times you’re knocked down, but how many times you get up again,” the coach tells us as he takes off my headguard and gives me an ice pack. Christian pats me on the shoulder. If it wasn’t that he lived on the other side of town, we’d probably hang out together after school. On my way home, I feel the pain around my eye. But pain passes and I can still see. I put on my headphones and turn up the music, and the next moment everything is forgotten. I like quite a lot of weird things, really. Like pancakes and bacon. A glass of ice-cold milk in the middle of the night. A shooting star in the sky that isn’t a plane or a UFO. Or swimming on a warm summer’s day when everyone else has gone home. And I like it when Mom whispers something nice and her lips tickle my ear. I think she used to do it more before. But there’s something that beats it all. Something that makes me warm inside. A bit like someone’s turned on an oven full blast in my belly. And that’s singing. Not the sort that blares out of the radio and iPods of people in my class. I like the kind of voice that makes glass shatter and fills your ears to bursting. Sometimes I forget myself and sing at full volume when I’m walking down the street. Which is a bit embarrassing. And a bit cool. I live in an old building that could have looked newer. There are often people on the stairs, but if you don’t think about it, you don’t really notice them. Mom isn’t at home, so I sit down with a couple of slices of bread and do my homework. The doorbell rings, and Mom’s words echo in my head: You must never open the door unless it’s someone you know. Through the peephole, I see a man in work clothes holding up an ID card. It says Hafslund Utilities on the card, and there’s a picture of a face that looks a bit like the man in work clothes. He rings the bell again. Then he knocks on the door. He’s probably precisely the sort of person I shouldn’t open the door for. But he’s got an ID card in hard plastic and looks so official that my curiosity gets the better of me. “Is Linda Narum at home?” he asks through the gap created by the safety chain. Mom does get behind with the bills sometimes. It can happen to anyone. Every day is so busy and you have to remember so many things that I’m sure it’s easy to forget the bills. Luckily, I remember that I’m dying. “You can’t,” I say in a very sad voice. Sometimes my voice is the saddest voice I know. The man looks at me. “An oxygen tent?” he repeats. I tense my throat so there’s a whistling sound when I breathe in. I shrug. The more I say, the easier it’ll be to get caught up in ridiculous lies. So I don’t answer, just look at the man with hound-dog eyes. Once I’ve closed the door, I have to take a deep breath. Because I don’t have a tent. I’m not going to die. And I don’t normally lie, at least not every day. The world is full of white lies: someone’s got bad hair, wearing strange clothes, or acting stupid, but you don’t tell them that to their face. At least, I don’t. I keep my mouth shut. I quite often keep my mouth very shut. No electricity would be like staying in a cabin, every day. Or living in the Bronze Age. Best not to say anything about it to Mom. She gets upset so easily. It’s actually nice being at home alone, when you live like us. I watch a bit of TV before going to bed. The disadvantage of finding it easy to fall asleep is that I wake up easily as well. Suddenly Mom’s sitting on the edge of the bed, saying something I don’t understand. “What did you say?” I mumble. We give each other a good, long hug. Mom likes me. She really does. And I like her too. Mom tells me over and over how lovely I am. After a while, she lies down on the floor. Then I help her up onto the sofa and put a blanket over her. “You’re so lovely, my lovely boy,” is the last thing she whispers before she falls asleep. Outside somewhere there’s an amazing shooting star. I’m sure of it. Arne Svingen is one of Norway’s most prominent writers for children and young adults. He has also written several novels for adults, radio plays for NRK, and graphic novels. The Ballad of a Broken Nose has been translated into eight other languages, and was awarded the Norwegian Ministry of Culture’s Best Young Adult Fiction Award. 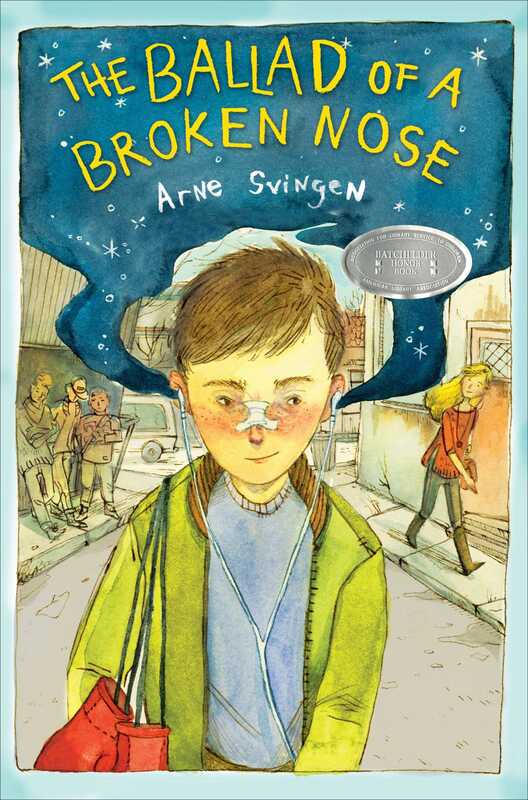 "With deftness and subtlety, Svingen shows a boy hanging onto optimism in the face of adversity and asserting his identity when he’s long relied on obscuring himself fin the background." "Bart's depth and the beauty he finds in his world are winning and moving. Lovely and profound. " "An absorbing, well-paced story with a heartening conclusion." * "The novel is like a many-layered slice of cake: in every bite there's a mix of flavors, textures and mystery ingredients, adding up to a delicious read."